A VPN supplies network connectivity over a possibly long physical distance. In this respect, a VPN is a form of Wide Area Network (WAN). VPNs enable file sharing, video conferencing and similar network services. Virtual private networks generally don’t provide any new functionality that isn’t already offered through alternative mechanisms, but a VPN implements those services more efficiently / cheaply in most cases. A key feature of a VPN is its ability to work over both private networks as well as public networks like the Internet. Using a method called tunneling, a VPN use the same hardware infrastructure as existing Internet or intranet links. 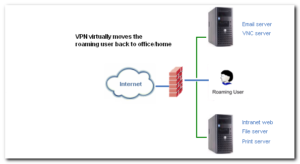 VPN technologies includes various security mechanisms to protect the virtual, private connections. In recent years, many organizations have increased the mobility of their workers by allowing more employees to telecommute. Employees also continue to travel and face a growing need to stay connected to their company networks. 1. A remote host (client) wanting to log into the company network first connects to any public Internet Service Provider (ISP).